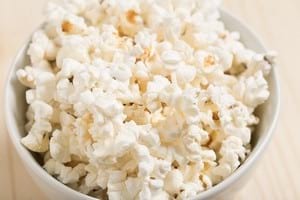 Popcorn is a snack commonly eaten in movie theaters. For the sake of flavor, it is typically served salted or sweetened. All joking aside you won’t be surprised to see that we are advising not to give ducks popcorn. The reason is actually very similar to the one we mentioned when answering the question whether you can feed ducks bread. For ducks, it’s important to have a balanced diet in order to avoid malnutrition and growth problems. Most popcorn is produced in such a way that it doesn’t contain any nutritional value other than carbohydrates. Manufactures add butter, sugar, salt and other chemicals to enhance flavor but this comes at the cost of extra calories. In addition, as wild ducks often feed in areas where they are threatened by predators, they have adapted to be able to “feed and run”. As a consequence, they have extra storage capacity in the part between throat and stomach, called esophagus. Some people mention that popcorn is harder for ducks to swallow as the kernels could get snagged in their esophagus and potentially lead to choking or abrasions. Conclusion: don’t feed popcorn to ducks and go for some healthier choices. What do you think about feeding ducks popcorn? Leave a comment in the section below.